Disciple: There is a difficulty with regard to time and space: they are always taken together as if they were inseparable, but space is reversible for man while time is not. Disciple: Space is three-dimensional. The question is: cannot time have two dimensions, since time for us is in a line? Sri Aurobindo: Time represents itself to us as movement or rather succession; it is dynamic. Disciple: Can it have two dimensions? Sri Aurobindo: What do you mean by that? Disciple: It is very difficult to imagine two dimensions of time. Sri Aurobindo: You can say that on a plane higher that the mind time becomes static,- that the past, present and future appear in a line (without a break) and are static. Sri Aurobindo: 8.30 p.m. (laughter); I have never bothered myself with these mental definitions. What difference is it going to make to you if you know the definition? Disciple: But space is something material. Sri Aurobindo: Why should it be material? Disciple: Only matter occupies space, consciousness cannot occupy space. Sri Aurobindo: Why not? How is it that you occupy space? You have a consciousness! Disciple: But such things like mind etc. do not occupy space. Sri Aurobindo: How do you know? And what is space? Disciple: Space is the point of intersection of two points. Sri Aurobindo: Why would it be always material? Sri Aurobindo: Why should it be always material? When you feel angry, for instance, you also get a disturbance in the physical nerves. It occupies space. Disciple: But that is not my consciousness; it is only the reaction of anger, not myself. Sri Aurobindo: That is because it does not suit your argument! How do you know what is your consciousness? What do you understand by consciousness? Disciple: “I think”, “I feel” – that is consciousness. Sri Aurobindo: That is not your consciousness, - that is the result of your consciousness. Do you think consciousness is a mere abstraction so that it exists nowhere? In a way, you can say that everything exists in consciousness, even space, etc. In fact, everything exists in consciousness and it exists nowhere outside of it. Then you come to Shankara’s position: everything, therefore, is Maya- illusion. That is the most logical conclusion unless you admit, like the materialists, that everything comes from matter. Disciple: Well, the conventional idea is that. Sri Aurobindo: What have you to do with convention? You have to see the Truth, never mind what people believe. You will find that thought, feeling, etc. take place in a certain space which, of course, is not physical space. It is something like the ether which pervades everything. The question may be asked; How far does space extend? You go from earth to the interstellar region, and then? Do you think there is no other kind of space? To my mind space is an extension of consciousness. Disciple: But extension is a property of Matter. Sri Aurobindo: Do you mean to say that when I get the experience of wide, extended consciousness, my consciousness becomes material? Disciple: No. But Matter has extension. Sri Aurobindo: That is what your mind tells you ! Disciple: That is what we see. 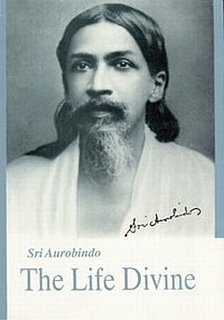 Sri Aurobindo: How do you see? Only through your mind, is it not? You can only say that these things – like Matter, etc.- represent themselves in this way to the human mind. And what is time, when you come to deal with subtler things? It is not a mere abstraction; it is a force, you can say it is the action of a force. It acts and produces effects by itself without any other factor. Time, you can say, is consciousness in action working in Eternity and space is consciousness as being in self-extension.